Since I have the iPad, I have been on the search for the right stand for my iPad. my wife saw last year at thinkgeek.com an arcade case for the iPad and did try to order it but unfortunately it was just an aprils fool. 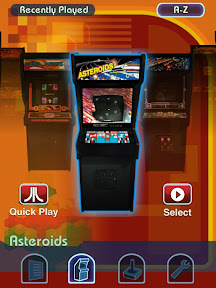 However so many people tried to order it that thinkgeek.com finally decided to build the arcade. They call it iCade. I had to order one ($99) and it is great. It came in a big box unassembled. The build is very easy and it comes with all tools, even two AAA batteries. The batteries are needed because the controls are communicating with the iPad via Bluetooth, which is great because you can connect the iPad to the power cord when sitting in the iCade for charging. The iCade switches on when you hit one of the 8 buttons and switches off when you don't use any of the controls for 5 minutes. The quarter screen in the front lights up when the iCade is on. The top of the iCade is easily to open to slide the iPad in or out. This thing is right now a attraction in my office. 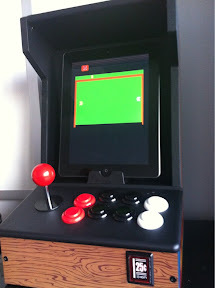 Even people who don't like Apple said they would buy the iPad because of the iCade. Not only does it look good there are even Atari games for the iPad which you can buy. I bought Atari's greatest hits (99 games for $14.99). Playing the games is like going back in time. Unfortunately the control is not easy and takes some time to get used. And pac man is not included in the bundle. The iPad screen is too long for the games therefore half of the screen is black. When you play the games without the iCade then the black part it replaced with controls. I am pretty sure there will be soon other arcade versions which are taking advantage of the iPad screen format. 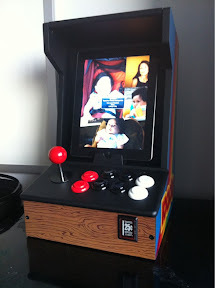 Overall the iCade is awesome even if you only use it with the iPad as a charger. We have now in the office every Friday at 5pm a game session since I have the iCade.